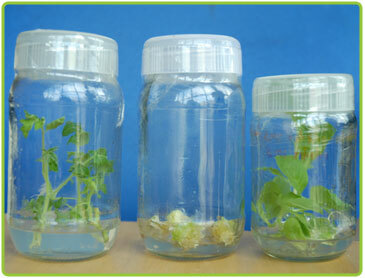 The Plant Tissue Culture facility provides an access to the researchers at VMSRF with state of art equipment and materials for culturing the various model plants of the Biology like Arabidopsis, Tomato, Tobacco and few economical crop plants like Jatropha and Safflower. It also provides a transformation facility to achieve the manipulations in the plant system. Facility hosts two Laminar Flow Transfer Cabinets for performing the culturing and transformation activities. Gene Pulser, an Electroporation apparatus from Bio-Rad, has been extensively been used for efficient gene transfer into Agrobacterium. 400 square feet area of Plant Growth Room provides a space for total research activity of foundation.